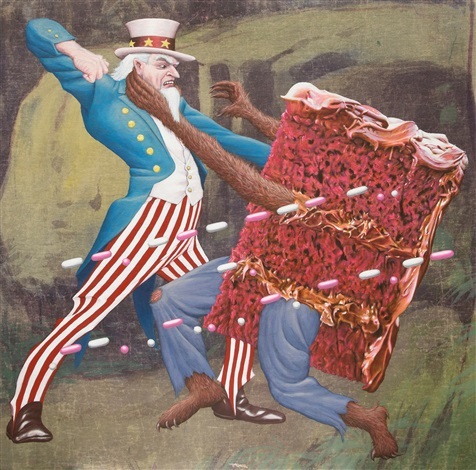 Jim Shaw combines exquisite naturalistic detail with complex cartoon imagery. Growing up in the 1950’s and 60’s in America Shaw was exposed to American culture in its supposed heyday. It was the time of starlets, heroes and comics. However, it seems that Shaw has never weaned himself away from the comics and posters of his youth. In much of his art he uses these cultural references to set both the subject matter and the narrative. He also uses as his references “the detritus of American culture, finding inspiration for his artworks in comic books, pulp novels, rock albums, protest posters, thrift store paintings and advertisements.” (Simon Lee, 2018). 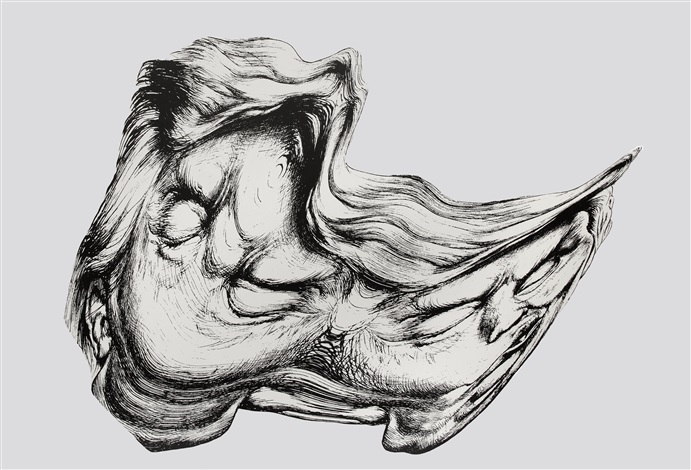 In his art he uses “sources and affinities ranging from William Blake to surrealism and pop art, DC comics, science fiction, teenage psychedelia, thrift store art, political cartoons” (Frieze.com. 2018). The raised fist of Uncle Sam about to strike the ‘cake’ may be a reference to the overconsumption of sweet things and calories within the USA. Shaw said – “When I was a kid, I was an avid collector of comic books. My parents were sick of it” (Bennett, 2018). He has never stopped collecting American culture whether it is comic books from the 1960’s, current affair or contemporary culture. He references current affairs in his drawing Fig. D2. Trump Smear #1. In this line drawing of President Trump, he has twisted and distorted the image to just be barely recognisable. This may have several meanings including the political scandals and smears that Trump has endured over the last 18 months since he took office, as well as what some would like to do to Trump, i.e. squash and smear him on the ground. One must conclude if these are the meanings that Shaw is not a fan of Trump and his presidency. In Fig. D3 “Top Hat Tire Man” Shaw again references America consumerism. 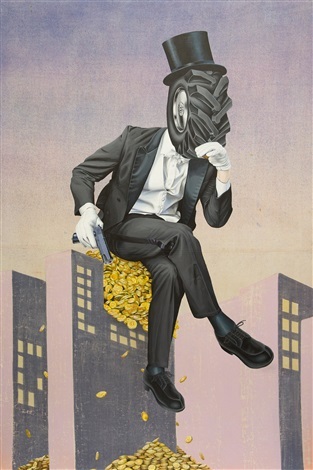 He has a man is a dress suit complete with top hat sitting on a pile of gold coins which are raining from the top of the building on which he is perched. The motorcar has been front and central in American culture since the 1950’s and it has been the source of riches for amongst others tire [tyre] manufacturers. The pile of gold may indicate the riches made and the falling gold the riches wasted on this rampant consumerism. Shaw leaves us guessing as the face of the top hated gent is a tire and we don’t see whether there is joy or sadness as this display of riches. Shaw uses the imagery of popular culture and iconography as an allegory to aid his commentary on the cultural trash and consumerism which he sees in contemporary America. He maybe harking back to betters already done! Bennett, O. (2018). Interview: Jim Shaw. [online] the Guardian. Available at: https://www.theguardian.com/lifeandstyle/2000/sep/16/weekend.oliverbennett [Accessed 20 May 2018]. Frieze.com. (2018). Jim Shaw. [online] Available at: https://frieze.com/article/jim-shaw [Accessed 20 May 2018]. Simon Lee. (2018). Jim Shaw. [online] Available at: https://www.simonleegallery.com/artists/jim-shaw/ [Accessed 20 May 2018].